I love vegan food, but a lot of vegan versions of traditionally-non-vegan dishes can be disappointing if you are expecting the traditional version.1 This recipe doesn’t make any sacrifices on texture or taste—it is creamy and densely flavorful. In fact, I think the flavors are improved by not being diluted with dairy or eggs. I’ve served it to traditional ice cream lovers who enjoyed it. They were surprised to hear that it is vegan and doesn’t have any cream. 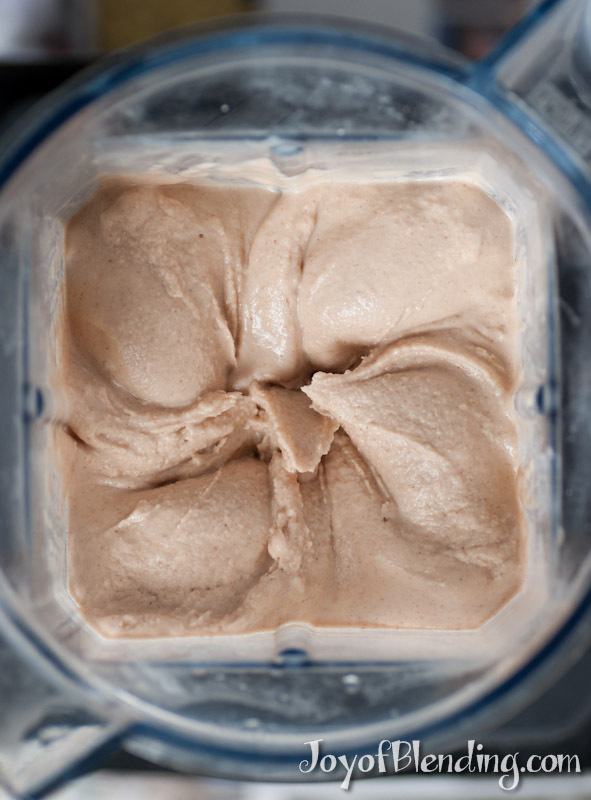 This recipe may be my favorite frozen Vitamix dessert to date. It is also extremely simple to make and has just two ingredients, plus salt and water. 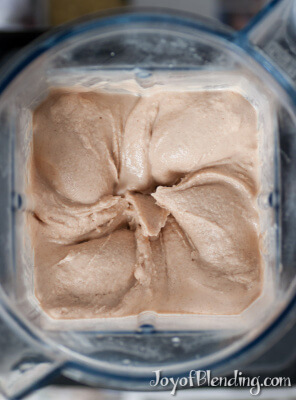 Using a Vitamix, you do not need an ice cream maker. For maximum smoothness I used the twice-blended technique: blend into a liquid slurry, freeze in ice-cube trays, then blend a second time. 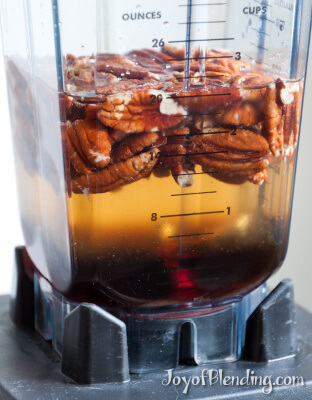 This recipe is intended for narrow Vitamix containers with 3″ blades. If you’re using a wide G-Series or Ascent container, scale up the recipe 1.5x. I recommend pre-chilling your serving bowls in the freezer so that the ice cream doesn’t start melting right away. To roast the pecans, I preheated the oven to 325°F and spread the pecans on a baking sheet. I put them in the oven, turned it off, and left them in for 12 minutes. You could roast them a bit more, but it is important to not burn them, which can happen quickly if you’re not careful. You can chop a few pecans and keep them separate if you want to use them as a topping. Blend ingredients on high until very smooth: ~90 seconds. Pour into ice-cube trays (this recipe should fit into two standard size ice-cube trays). Place in freezer and leave until frozen solid: at least 2–3 hours. When you’re ready to eat it, remove trays from freezer and blend the frozen cubes using the top speed. You will need to push hard with the tamper, and the machine will make a lot of noise, but it will soon start blending. The proper way to use the tamper is to push the ingredients in the corners of the container, down into the blades. 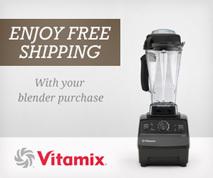 The Vitamix will make a low-pitched growl as it starts to circulate. Once it is really circulating, continue blending for about 5 seconds, then serve right away. You can freeze leftovers, and I found that they didn’t turn overly rock-hard. The trick is to not let any melt too much before putting it away. If you plan on having leftovers, get a container ready (maybe even pre-chill it as well), so that when you serve your ice cream, you can also get the leftovers into the freezer quickly. If you’re serving from the freezer, I think it’s best to let it warm up a little bit before eating. Not so much for scoopability, but for flavor. The flavor is most intense when the ice cream is just barely frozen, about how it is right after blending. I have always preferred dark (Grade B) maple syrup because of its richer flavor, but I’m sure this would also be good with Grade A.
I’ve previously referred to this sort of dessert as sorbet, but I recently realized that may bring to mind the wrong image for many people. The standard American characteristics of sorbet are light, fruity, and icy. This recipe and my previous nut sorbet recipes are much closer to an ice cream in terms of mouthfeel. Pecans have more fat than pistachios or peanuts, so this recipe is even creamier than previous ones. Maple syrup and pecans keep all year if stored properly, but there’s something fall-like about the flavors. Impress your guests over the holidays, or just treat yourself, by whipping up this delicious dessert. 1. 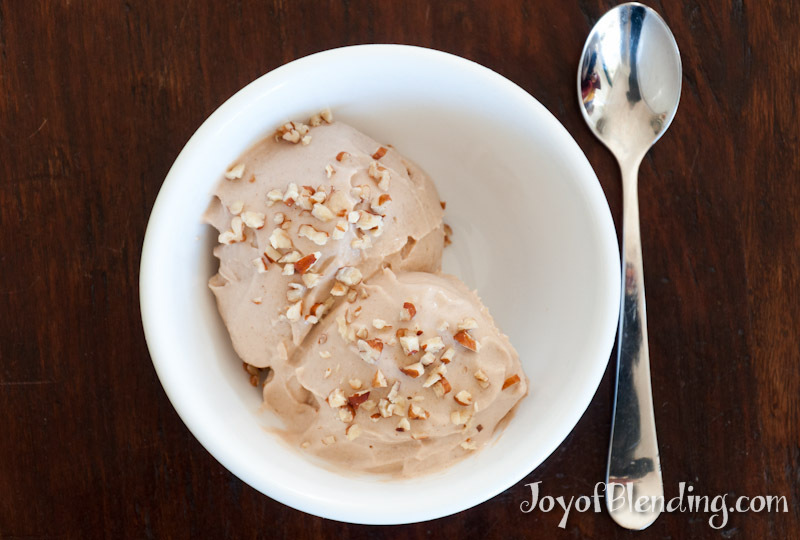 In terms of vegan ice cream, I often see recipes whose main ingredient is frozen banana. I don’t like bananas in any form, but I’ve heard from many banana eaters who think that calling blended frozen bananas ice cream sets people up for disappointment. It’s great if you enjoy it, but I don’t think anyone would confuse it with traditional ice cream. Here’s a discussion on a vegan forum. Never seen a creamy “ice cream” made without banana. Looks really good, Adam. Nice work. We couldn’t decide on an adequate description: phenomenal? amazing? How about just plain delicious! And preparation couldn’t have been easier. Thank you! Just wanted to thank you for your efforts to make this website. Lots of very valuable information, which will make my learning curve much steeper. Hope you will continue to post new reviews/info/recipies. I had been meaning to try this recipe for a while and finally tried it last night. The recipe says that it makes 4 servings, so I got my container ready to store the remainder, as per instructions. But I ate the whole thing! Absolutely delicious! Thank you! if i use the ice cream setting on my vitamin do i anything different? You can use that preset. Depending how it goes, you may be able to stop the blend early, or it may require a bit more blending after the preset stops.